I have recently returned from a much needed vacation... in which every room had Palm Tree Decor... by the weeks end, I didn't want to see another palm tree home decor again... or maybe until next time! It was a huge joke among the couples there! 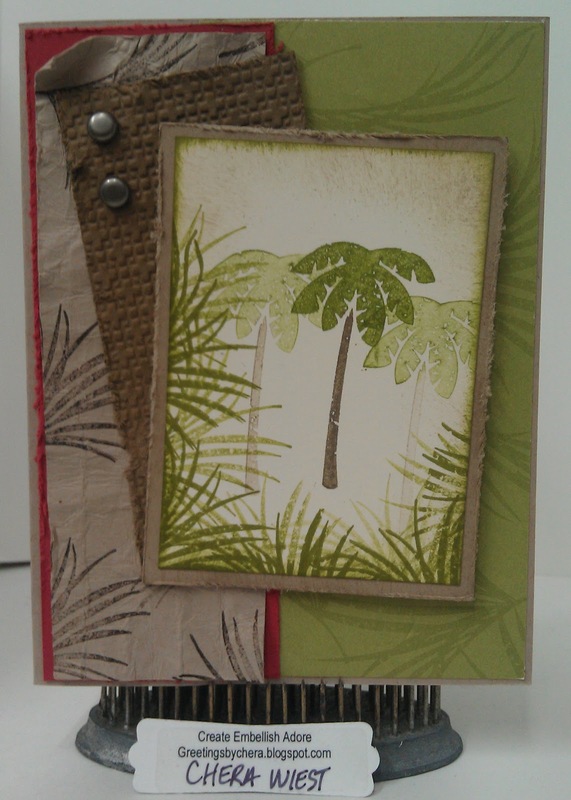 I found it ever so suitable to make my Thank you card for the other couple that joined us to be using the retired Tropical Island set. I wanted something worn looking... with the crumbling of the cardstock that was under the embossed cardstock, I ruff up the edges. While it was my first time stamping in a while I am very pleased with the outcome! Just think of every time you see a palm tree you will think of your wonderful vacation. Love the card!